Microwave worked well enough however after a year of use it began coming on by itself. we considered our self lucky to be home and able to just unplug it before anything happened. 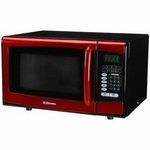 Great microwave besides the fact it heats unevenly at times. It's stylish and fits well in my kitchen. 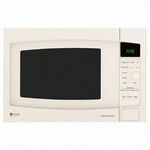 Good little microwave to use for a single persons needs or a young couple just starting out. Work very well with the defrost feature and the pop corn feature. Performance This microwave performs very well for all functions , even the potato and pop corn ones. I like the rotating glass plate , as it saves me time having to turn the food one quarter when thawing some meats out. The reheat button is a favorite when running late for dinner or re heating left overs for a evening snack. Settings/Features The setting were well marked and easy to figure out in the instructions. The clock was easy to set, and all functions worked as described. The only one we had a problem with was the defrost one at first as we hit the button too many times and we partially cooked a couple of meat items! Ease of Cleaning A bit tricky to clean where the track goes for the rotator for the plate in the bottom of the microwave, but it is easy to clean. I just put a cup of water in there with a tablespoon of vinegar and let it run for 2 minutes. The steam loosens the food and it comes right off.. The black exterior does show a lot of finger prints but they wipe right off. Ease of Use Easy to use, just set the power time and selection and you are good to go with cooking! Durability I have had mine for 6 years and it is still going strong! Design The only draw back I have is the way the handle to open the door is a button you push and not an actual handle. it would be easier to open by an actual handle on the door itself, if you didn't have a way to push the button if your hands are full. I received this microwave for free when I worked for a moving company from a customer who was moving and did not want it anymore. Since he was getting rid of it, I wondered how well it still worked. But that was six years, and it has worked great ever since then. Settings/Features I have been completely satisfied with the settings on this microwave. The preset buttons (such as popcorn) are accurate in their power and timing. There is not a feature that I would like that this microwave is missing. Ease of Cleaning If food splatters, it can dry on pretty hard, and it can be hard to scrub the inside of the microwave, especially the top and back wall. But the plate is dishwasher safe, so if something simply overflows onto the plate, it can be easily washed. Ease of Use The power settings take a little time to figure out, and the timer and clock use the same setting button. It can be irritating to try to set the timer and accidentally reset the clock, and vice versa. Durability As mentioned above, I received this microwave used, and it has lasted great. Can not find something better! 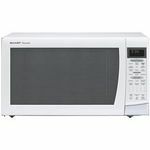 For the price of the Sharp Carousel Microwave, you can not find something that works better! I was so pleasantly surprised with how awesome this microwave really is, I was not expecting it to be anything all that special, but I do really love it. I have small children and I used to make sure that I kept it locked all of the time and I loved that feature, it is nice to have it locked to where little hands can not push all kinds of buttons and make the microwave start going when their is nothing inside of it. The microwave cooks very well and true to what directions on anything you put in it are, it always comes out just right with the time that the package says to use. Even the popcorn button on this microwave works great and my popcorn actually always comes out perfect and is never burned or not cooked enough. 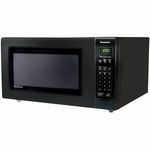 It cleans like any other microwave and wipes out pretty easily and you can move the turn table out to clean it easily. 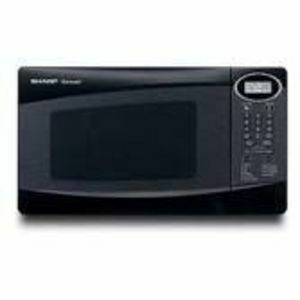 This microwave works perfect and has met every expectation I have had and exceeds them. I wish I could give this microwave a better score than ten because it really is the best in my opinion, although that could be because our last microwave was a timer microwave and stopped working with the timer still going. Even so, this one is still pretty awesome, it has a pretty cool design even. I love how it is able to pick the different wattage based on what you are putting into the microwave, and how easy it is with the buttons for each thing, but what is really great about the microwave is my popcorn has never burnt, my soup is never cold, and when I warm up a bowl of food it is not piping hot in some places and ice cold in the rest. Ease of Cleaning I use warm water to clean the inside and it works really well, and there are no stains or anything like that inside still. I believe that it is Teflon coated or something. Durability I have had this own for three years and through four moves, and it doesn't even have a scratch. Design I love the design, it matches really well with my kitchen even though its the only black appliance. I bought a Sharp Carousel Microwave because it was small and affordable and perfect for my man cave. I didn't want to spend a lot of money just to have a microwave in my basement. I could just walk upstairs and use the microwave in my kitchen, but since I was able to get my Sharp Microwave at an affordable price I decided to get one just for the basement. It works great and doesn't take up much space. It sits right on top of my mini fridge. It is simple to use and has held up without any issues for two years. Performance The Sharp Carousel microwave works great. It obviously has the rotating plate so your food cooks evenly without having to stop it and move things around. Just set the time and you're done. Settings/Features It has a few settings for popcorn and such. It is really basic without too many complicated options to try and figure out. Ease of Cleaning The carousel plate is removable and dishwasher safe. It's very easy to wipe out and disinfect. Ease of Use It's very simple to use with push buttons to set the timer and start/stop. Doesn't get much simpler than this. Durability The microwave came with a 5 year limited warranty and I've owned it for two years and I've had no issues whatsoever. Even if quit working now I would say I got my money's worth but it covered by warranty for another three years. Design It's small and compact. Nothing fancy but looks good in my man cave. This microwave works like a dream! It cooks efficiently and FAST! It is very easy to use. I love how I can lock the buttons to keep my 2-year-old from accidentally starting it. 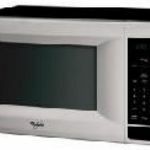 It is the best microwave I have ever used! I also appreciate how I can place a big casserole dish inside with a little room to spare. I've had my Sharp Carousel counter top microwave for almost 10 years now and everything still works. I use it every day, sometimes several times a day. It is wide enough to fit a large dinner plate or a square casserole dish. Performance I use it to microwave everything from chicken, rice, scrambled eggs, yams, potatoes, pasta, squash, casseroles, soup, and hot chocolate. Since it is small, some things have to cook a little longer than a big microwave, but it still cooks things all the way through and just as hot. Settings/Features This microwave is simple to use. I just enter the cook time and push start. It also has a "minute plus" button, which I love using. It also has a clock, timer, and several other buttons for defrosting meat, making popcorn, etc. -- but I haven't really ever used those. Ease of Cleaning I don't know of any microwave that is easy to clean. However, since this is a smaller microwave, it is just hard to see in it and get your arms in there to clean everything easily. The inside it not a single piece of material, so there are corners and edges that collect food and grime. Design It has a glass carousel, which can be removed for easy cleaning. The door is a bit loud when closing. Since the microwave isn't really tall, if you boil rice or pasta (something with a lot of moisture that has to cook for a long time) and you use a tall serving bowl, it creates a lot of moisture and can start to drip inside from the ceiling of the microwave, which is gross! I will stop it part way through cooking and wipe the ceiling off with a towel to avoid this. I have had my Sharp microwave for a while and it is still working quite well. The clock on it no longer works. It just flashes 88:88 all the time. Even if someone resets it, it goes right back to it. It started one day while I was at work and I haven't been able to find a way to fix that. In spite of its clock flaws, it all works fine as far as heating my food goes. I never had a problem with it getting too hot or not working well. Even the microwave count down of the seconds still works, which surprised me given the non-functioning state of the clock! It's just as easy to clean as any other microwave since the glass carousel plate comes out and it has all the same basic functions. If you're someone who likes to have a lot of preset buttons for food, this isn't the choice for you. I tend to like to just set it to my own specified amount of time and this was an inexpensive microwave so it works well for my needs.